Today I discovered a ton of teardrop accounts on Instagram. Seeing all those amazing teardrops gave me even more motivation to get this thing started. If you want to see some awesome teardrops go search #teardroptrailers and #teardropcampers on Instagram. You won’t be disappointed. You can also follow us too, just follow the social links in the sidebar. Oh! One more note before we get into how to build the walls on a teardrop trailer, there is a possibility we are going to document TWO teardrop builds this year! Not one but two! Hopefully it works out. There are so many different ways to build and attach the walls on a teardrop. I’ll talk about a few different ways that are popular. You can go on the forums and see them all for yourself and decide how you will want to build yours. The way you build your walls also depends on how are you going to use your teardrop. Are you just going to do some light weekend camping? You probably can get away with light plywood and a 1×1 frame or 1/2 inch sandwich. If your going off road you might want to think about bulking up by using some heavy plywood and adding in more bolts and corner brackets. I’m not going off road and I don’t have a truck to pull the trailer with so I’m thinking about light and efficient. I also want a little bit of insulation to cut down on condensation. So here are a few popular teardrop wall options. One way to build teardrop walls is to frame them with 1×1 and insulate with the pink foam board insulation. It’s a more traditional build option, like framing a house with studs. I’m guessing that’s where it came from. This thought just popped into my head and I’m sure someone already tried it but I bet you could use metal studs and turn them flat in the wall. It would cut down on weight. You would have to know what your doing with metal, I don’t have any experience with metal so I’ll just stick with wood. One downside to this is that if you are planning on building a traditional shape teardrop you have to frame out around all the curves and rounded corners. Free updates and guides when we post how to videos! The second popular way is to kind of sandwich a few layers of plywood together. I’ve seen it done a few times and it is one of the most popular options. You basically have to router out the whole inside layer of plywood for areas to put insulation and run wires if you are running wires in the walls. This is the best way to get good structure and still follow the curves of the teardrop shape. A lot of kits you can buy are set up this way. An easy and quick way is to just use one thick piece of plywood. It’s easy, quick, cheap, and relatively light weight depending on how thick the plywood is. Of course if you are going to use plywood that’s an inch thick you are adding some crazy weight and it kind of defeats the purpose. This method has some serious drawbacks. It doesn’t help at all with condensation which can be a big problem in the teardrops. There also is no place to run electric wires if you need some electric in the wall. This would be the last method I would try and would not recommend it. Here is what I’ve decided on for the walls on my teardrop. I think I should name the teardrop actually I’m going to get tired of calling it “my teardrop”, I’ll start thinking about a good name. Ok, for the outside sheathing, I’m going to go with ¼ inch ply. For the inside “studs” I’m going to use the sandwich method with 1/2 inch. And for the interior wall I’m going to use 3/8ths or ¼ inch. Using 1/4 inch on the outside sheathing I will be able to use ¾ inch and it will fit right in. On the top of the walls where the wall is going to meet the roof I’m going to leave the middle 1/2 inch sheet and the inside 1/4 inch sheet 3/4 short. that will give my roof something to sit on. For insulation I’m going to use the foil insulation that’s used for air ducts it’s thin light and very efficient. You can see it here in the products from amazon, I’ll link to it. You might think you don’t need insulation but you really want to cut out as much condensation as possible. Condensation can be a killer in a teardrop. Everything gets damp which promotes mold and rot. Keep that in mind when you plan your teardrop build. I’m also thinking of layering the whole inside of the trailer with carpet instead of finishing the wood. This will do a few different things. I’ll be able to buy cheaper plywood for my inside walls since I will just be covering it up and not finishing it, and it will be another layer that will help with condensation. I think I might leave the ceiling bare wood and finish that off nice and pretty and just cover the walls with a thin carpet. You see it all the time in manufactured RV’s. I’ve also been tossing the idea around to use wainscoting or paneling on the interior. 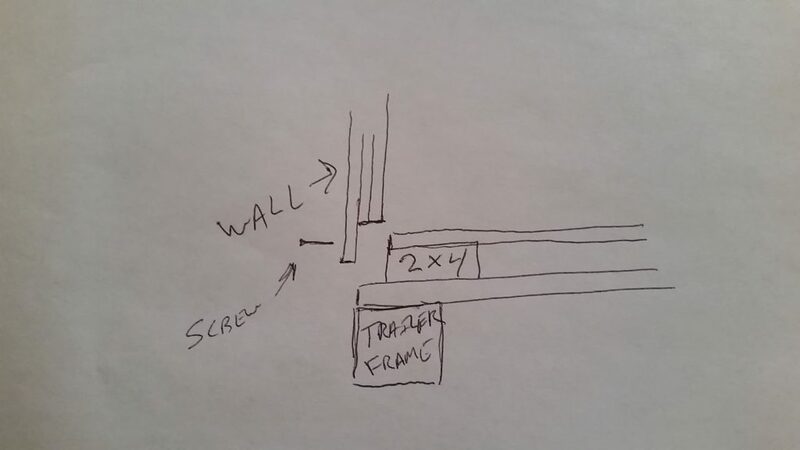 In my post about the floor (which you can find here) I had a little crappy diagram showing the metal frame and how I’m framing the floor. After thinking about the walls I have a feeling I’m going to have to change that. All I’ll do is move that flat 2×4 that is flush with the outside edge in ¾ of an inch. That way my wall will sit right on the metal trailer frame and I’ll screw the wall to the 2×4 in the floor from the outside. I’m also going to run the outside sheathing down to cover the frame. Here is a little better diagram since I hand drew it. The wall slides down onto the trailer frame and the screws go through all three sheets into the 2×4. What are you planning on doing with the walls on your teardrop? 3 Steps to Making Poor Mans Fiberglass, Does it Really Work? DIY Teardrop Trailer Cost, What is the Average Price? I am documenting each step as I build my teardrop trailer. If anyone is interested in a teardrop for sale maybe they might be inspired to find out how to build a teardrop camper. I'm planning on having my teardrop camper plans available once I finish drawing them. Stay tuned for more great info on teardrop campers. You can also contact me at teardroptrailerbuild@gmail.com. I'm a web designer and also a carpenter. I figured I would build a site dedicated to my teardrop camper build. Website by Macpherson Marketing. We are a participant in the Amazon Services LLC Associates Program, an affiliate advertising program designed to provide a means for us to earn fees by linking to Amazon.com and affiliated sites.